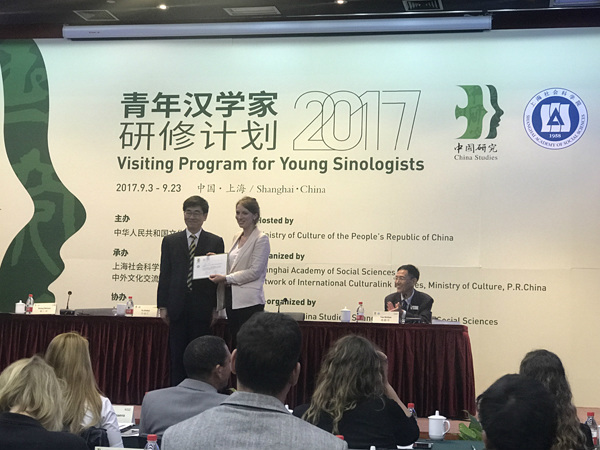 A total of 30 sinologists from 29 countries recently graduated from the 2017 Visiting Program for Young Sinologists. The three-week study program was concluded on Sept. 22 in Shanghai. After the study and research of some 20 days in China, the young sinologists have all finished their tasks. During their study, they have deepened their understanding of both China and sinology through various forms of learning such as collective lectures, one-on-one thesis supervision, and seminars. Young sinologists from different countries and cultural backgrounds conducted frank and in-depth discussions with related scholars in Shanghai, establishing profound relationships. Apart from lessons and thesis work, they also traveled to a number of places in Shanghai to gain an intuitive understanding of the city’s development. One of the young sinologists, Mohammed Abu Ahmed, a history teacher at the University of Punjab in Pakistan, said that he took China as the core of his research because the country’s emergence is mainly responsible for the current profound changes in the international situation. Ahmed is currently working on a thesis on China’s Belt and Road Initiative and its influence on South Asia. As an important port on the marine Silk Road, Shanghai has always been a city of cultural collisions. As a result, the study program in Shanghai is special to the Pakistani scholar. Apart from foreign sinologists, Chinese experts who participated in the program also gave their evaluation. People-to-people bonds and cultural exchanges are the social basis for Belt and Road construction, serving as a foundation for policy coordination, facilities connectivity, unimpeded trade, and financial integration, said Li Xin, a researcher with the Shanghai Institutes for International Studies. Therefore, the program itself is a part of the construction, he added. After the conclusion of the program, their research will be collectively published, covering various fields, including global governance, China’s relations with neighboring countries, overseas Chinese, and the external communication of Chinese culture.